After spending about 30minutes perusing the shelf and speaking with the Shop Sommelier, I decided I needed to get some air and let my mind settle, all this wine talk, young vintages, great producers, and indecisiveness had given me a bit of a headache. While growing up as a kid, my Oupa (The Dutch, German and Afrikaans word for Grandfather ) would always throw my brother and me into the front passenger seat of his old Mercedes E Class and drive us down to the local ice cream parlour, he had an insatiable appetite for ice cream. The ice cream parlour owners were second generation immigrants, and in those days (late 80’s South Africa) ice cream was mostly 100% natural made; I’m talking about the good stuff, real ice cream, slow whipped, more milk than cream and natural fruits, homemade caramel, fudge and chocolate flavours. These adventures became such a regular occurrence growing up with him, and we treasured the long drives around town with him eating ice cream wherever we could. I decided the best way to scare away this possible headache and clear my mind was to walk around and search for the busiest Gelato shop. Let me tell you that there is an incredible Gelato shop around every corner in Italy and a congestion of them along the Piazza del Duomo in Milan. While each one I looked at was busy, I was looking out for local kids and the ice cream shop they were hanging out at. Eventually, I saw a group of them and asked in broken English-Italian where they got their ice creams, a young boy pointed me around the corner and gave me his paper wrapper with the name of the shop. A quick couple minutes’ walk and I were there…Gelato Heaven! 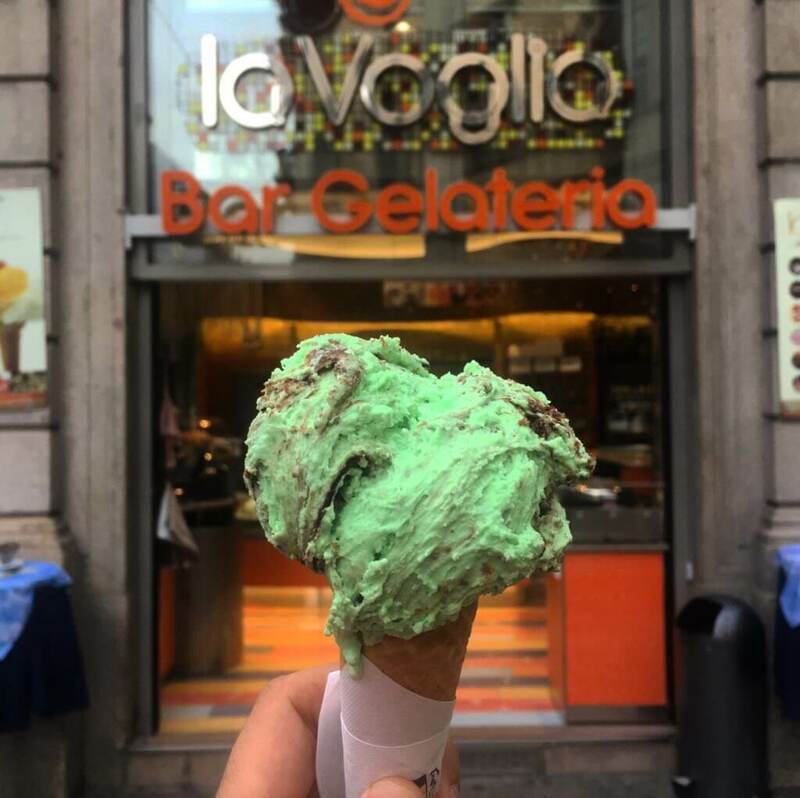 La Voglia bar Gelateria was everything a kid could dream for, every possible flavor was there, and the owner told me that they only use fresh fruit in the fruit flavored Gelato, real ground up nuts inside the hazelnut and pistachio. I settled on my long-time favorite, mint chocolate chip – there is something about soft green ice cream dotted with dark chocolate chips that get me every time…like my Oupa, I could eat a big tub of it in one go! With my Gelato in hand, I walked through the side streets exploring the alleyways and architecture, just across from the Gelato shop is an institution of the city, Piccolo Teatro Grassi. Founded in 1947 by Giorgio Strehler, Paolo Grassi and Nina Vinchi. I didn’t get a chance to visit a show, but I did manage to have a walk around and see the stunning interior and 400+ seat theater…if you are traveling to Milan and have a fondness for theatre you can see their schedule here. 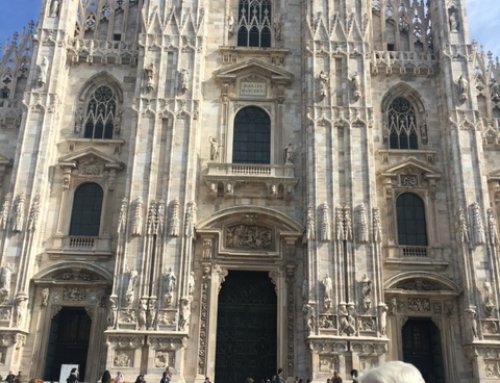 I walked around the city for about 30-45min passing some incredible buildings, lost in the beauty of an old town, finishing my Gelato and contemplating which wine I was going to drink. As I walked back to SignorVino, I went through my memory of all the wines again, recalling each label, producer and vintage. I arrived back to see the Shop Sommelier hanging around the doorway when he recognized me he seemed like he had been searching the streets with his eyes for me. He rushed over and said he had news for me and could perhaps help in this dilemma of choosing wine. We walked into the shop and sat at the antipasti counter, he offered me an espresso and glass of water and then asked me the question, “Sir, did you decide on the wine already, because I have some possibility for you on this?”. When I told him that the walk around the city and Gelato had cleared my mind and given me the answer of which wine to buy, he looked sad, like I had no need for his information anymore. He explained that he had called his manager who was not on duty and asked about the wine, what to expect from the characteristics of the vintage. He confirmed to me that his manager was a big fan of the wines from this producer. 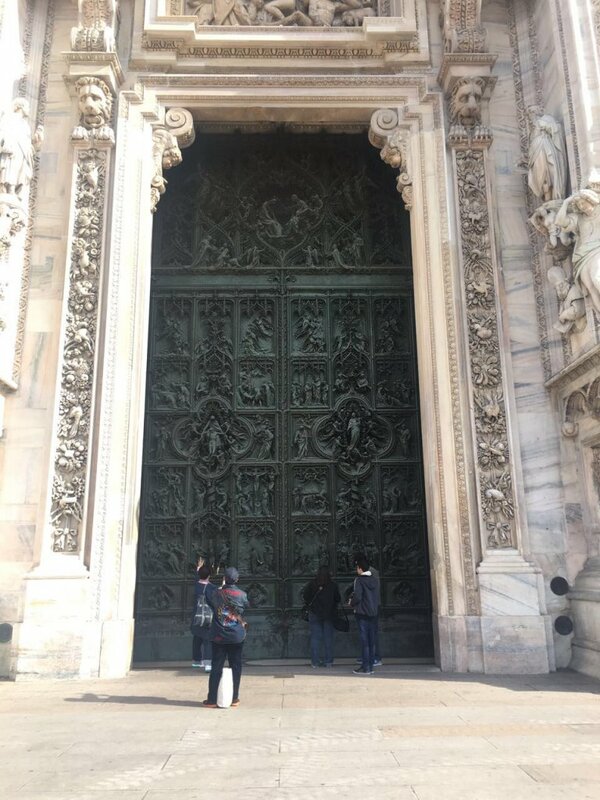 He knew the vintages like the roads around the Duomo and the vineyards of the DOCG; which was about 2-hour drive to the wine estate, so quite possible for a city slicker to visit over the weekend or a quick trip out in the work week. I am of course talking about the beautiful majestic rolling hills planted to the Nebbiolo grape in the Barolo region of Piedmont. The wine we are discussing is the Giacomo Conterno, “Barolo Riserva”, 1993 vintage. 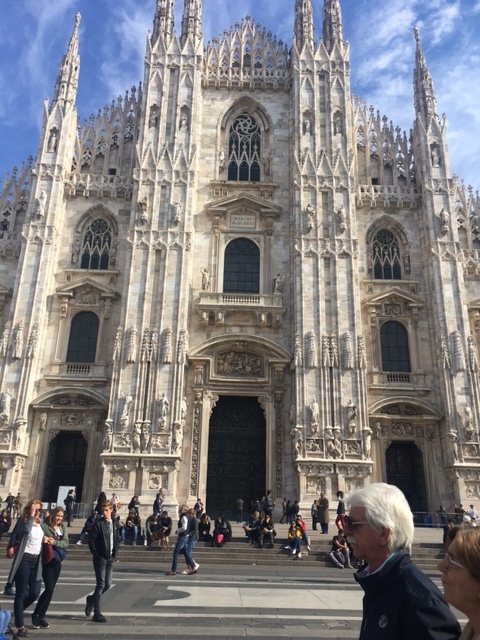 As I had mentioned in “A Day in Milan – Part 1”, I had had concerns that the 1993 vintage would not be showing as well given the weather condition of the seasons throughout the year. On top of that, the wine was selling for €189.00 (AED800 at the time), a fair amount of cash to be spending on an average bottle of wine…or average anything to be honest! As I walked through the old city streets earlier in the day, enjoying my mint choc-chip ice cream, breathing in the fresh cold air of an autumns day, watching the fashionistas go about their day and reminiscing about old times, both my own history and the cities, I had decided that this was the wine I should take the chance on. 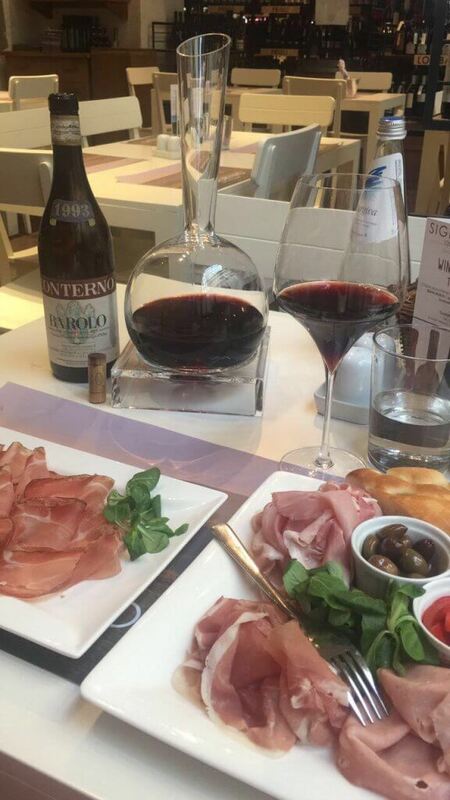 After all, it’s not every day that I am in Milan, down the street from the Duomo, able to drink an old vintage wine and enjoy freshly sliced Prosciutto of Parma and San Daniele. When I told him that this was indeed the wine I wanted to take, he was bursting with happiness and rushed to get the bottle, returning to where I sat cautiously carrying the bottle with both his hands. He asked if I wanted the bottle wrapped or in a gift box and I told him we were going to drink the bottle together then and there, his eyes widened, and a broad smile appeared on his face. After cutting away the foil closure around the cork, we decided to use a classic sommelier two prong-opener instead of the conventional waiter’s friend, sliding its blades down the sides of the cork and bottle neck to ensure an easier, clean pull of the cork. At first, the cork gave a bit of a fight and didn’t want to budge, but once we had given the blades a chance to lock into place and firmly but gently began to twist the opener and bottle, the cork gave way and joined in. On inspection, the cork was in excellent condition, have seeped through, dark color stained into its pores, a clean, fresh smell finalized the assessment and we were both in agreement that we could proceed to the next stage of wine tasting. The global body of wine education, the Wine and Spirits Education Trust or WSET for short, created a process known as “Systematic Approach to Tasting wine” (SAT) which teaches wine professionals and aficionados how to correctly know if their wine is suitable for drinking, because believe me when I tell you, there is nothing more awful than putting faulty wine in your mouth! We poured a small amount of wine into a glass and started the SAT inspection. Appearance: Visually the wine was in perfect condition, it was clear, with a medium to pale intensity and a beautiful ruby-tawny color (usually old Barolo has more of an orange-brownish-tinge). Nose: The biggest difference between young and old wine is generally on the nose, young wines are bashful and jump out the glass with their aromas, while older vintage wines are more shy, they take time to let you in, sometimes it takes hours…This wine was different; the nose was clean with a pronounced, intense nose that was throwing out aromas of licorice, sweet pipe tobacco, chocolate cherries and a touch of aged balsamic vinegar. The Palate: For some, once you tick off the Appearance and Nose boxes, tasting becomes a formality, since you are already 99% of the way and agree that the wine is good. 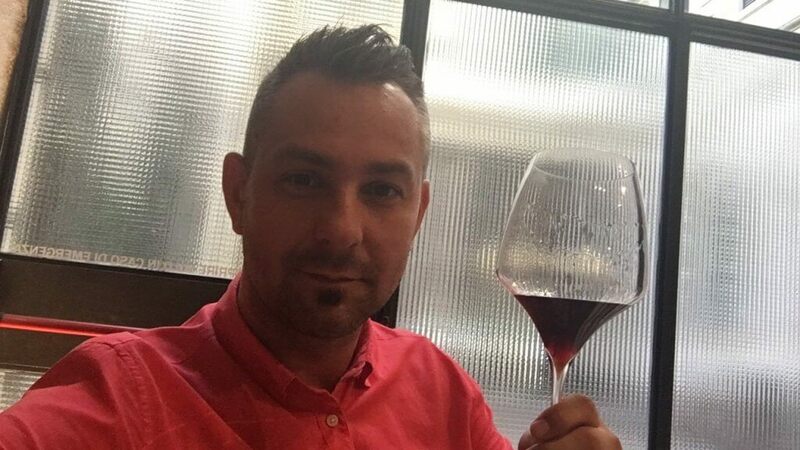 However, don’t discard tasting in arrogance, there are some faults which can only be picked up by the palate, it is always necessary to take this final step, and so I passed the glass over to the Wine Shop Sommelier to give him the task of the final assessment. He tells me the wine is dry, medium bodied, low to medium tannins that are soft and a low acidity to the wine. He describes the flavors on the palate as dried cherries, dark chocolate, aged leather and a minty background. Conclusion: He said the wine was spectacular, a long, slow, lingering palate that he could still taste minutes after sipping the wine. I turned and walked towards my table; I asked the waiter for the cold cut selection of Italian Hams and a bottle of water. I watched as the Shop Sommelier, brought over the bottle, a decanter and a candle, placing them on the table. First, he lit the candle and then proceeded to lift the decanted with one hand and the bottle from the base with the other, they met just above the dancing flame. Slowly he emptied the content of the bottle, this beautiful Barolo, bursting with aromas from across the table. My selection of cold cuts arrived, and the Shop Sommelier poured me my first glass, placing the glass in front of me, wishing me a pleasant meal and retreating to the side station to watch my reaction to the wine.